This is an interview with Hannah Fazio, who has been teaching yoga for five and a half years. Hannah is a yoga instructor living in Brooklyn who also practices creative arts therapy. For the past year, she has worked with the nonprofit Exhale to Inhale as a yoga instructor at a women’s shelter. Hannah has brought the yoga practice into nursing homes, hospitals, church basements, and studios. I first sought the practice in college after I experienced trauma. Back then, I did not know what trauma was, or rather, I did not know that someone who had not gone to war could experience trauma. Yoga brought me back into my body; it allowed me to experience my body as a safe place again. Now I am inspired to share the practice with others, so that I can help people become more aware of their bodies and their behavioral patterns. When I see others experience the transformational power of yoga and meditation, that is rewarding to me. Time and again, when I taught at the women’s shelter, the class would go into savasana (final resting pose), and afterwards an outpouring of information would flow from one of the students. The practice allows the person to slow down and be quiet. In doing so, people become more aware of their situations; they become more aware of what they have been going through, and how they feel about it. Then perhaps change can come. It is a powerful practice. They have taught me that yoga exists in me. I do not need fancy props and fancy clothes to practice. Nor do I need to post pictures of myself in my underwear on instagram to be a yogini; I need to practice and show up only for myself, and be more in tune for my students. My students have also shown me that I do not need to teach at a fancy/prestigious yoga studio to be a yoga teacher; by sharing the practice with others, I am a teacher. Trauma-informed yoga addresses trauma in the body. Many individuals in the shelter system have been traumatized by unsafe living situations, and they are further traumatized by over-extended institutional systems. Yoga allows individuals to address their own trauma, to practice interoception (the sense of the physiological condition of the body), and examine emotions and belief systems that may perpetuate certain behavior patterns. Yoga does not do this difficult work for anyone; it is up to the individual to become aware, and then act on information as it arises. Yoga also does not directly fix the systems of socio-economic oppression, but it does encourage people to wake up to their own power. Through yoga, we wake up one by one. Through mindfulness, we learn to act in an intentional way. Social change comes when large groups of individuals begin to act intentionally. I would carry lavender essential oil. It is nice to have a ritual where everyone receives something tangible. Lavender helps relieve anxiety; not having a solid place to be can be stressful. 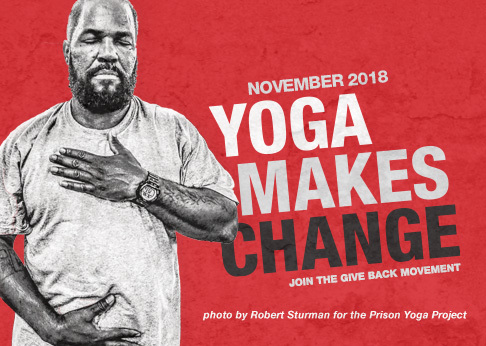 I believe that governmental and philanthropic organizations will begin to honor yoga as a powerful preventive tool for a multitude of physical and mental health issues. In my opinion, it is not up to yoga teachers to serve more (most yoga teachers I know are generous with their time and talent). It is up to institutions to acknowledge yoga teachers and create programs in which yogis and yoginis can share their skills with others, and be appropriately compensated.